Vlad the Impaler isn’t your average prime minister. Oh no – he has a bit of a tune in him too. Well, to that list we can now add ‘jazz singer’. 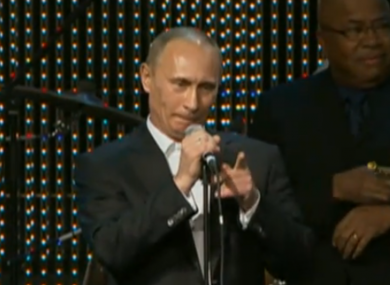 Because – although the performance was more wooden than an orchard – last night Putin took to the stage at a charity fundraising gig, bashed out a few notes on a piano, and then launched into a rendition of ‘Blueberry Hill’ – a tune more usually known as being crooned by likes of Fats Domino or Elvis Presley. We’re not sure if Vlad has a future in jazz, but at least we now have some indication of how well he might have performed when he infamously sang Soviet-era songs with the ten spies involved in the ‘Spy Swap’ earlier this year. Here’s the more famous Fats Domino version for your comparative pleasure. Email “Vladimir Putin: Action Man, fighter pilot... jazz singer”. Feedback on “Vladimir Putin: Action Man, fighter pilot... jazz singer”.